Voodoo Grill has gator bites and other super Cajun specialties, a timed burger challenge, southwestern style options, and more! One of the most fun and laid back bars to be at in Mystic! Live music Thursdays and Fridays, Karaoke on Saturdays, and regular Trivia Nights! Seasonally serving breakfast & brunch time drink specials from 9-12 AM on Sundays. Usually Spring-Summer, but call ahead to confirm. 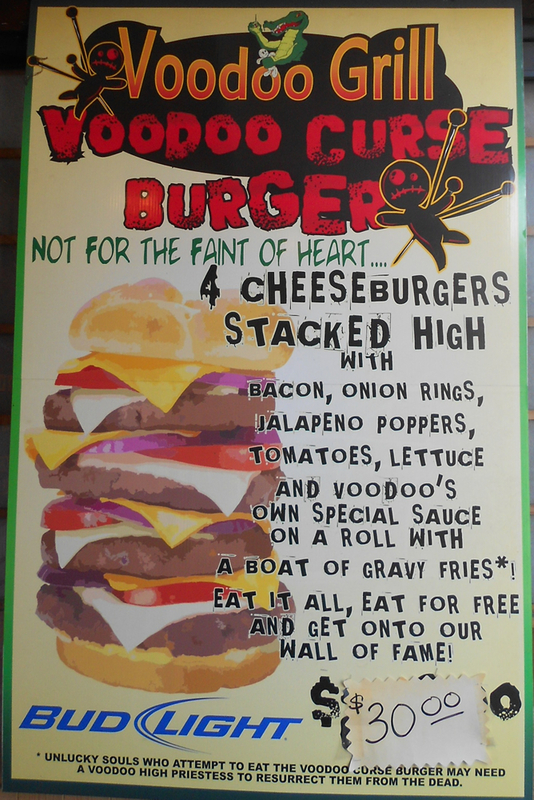 Home of the Voodoo Curse Burger Challenge! $2.50 Bud and Bud Light drafts / $2.50 PBR 16oz. cans / $5 house wines and well drinks / $6 Hurricanes / $5 Appetizers and 1/2 off chicken wings! Voodoo Grill in Groton/Mystic has permanently closed. It was sad to see them go. We wish them the best. Thank you for the reminder to update this listing! Anyone know what to do with a Gift Certificate for Voodoo Grill, or am I out of luck?